Banglalink New Connnection offer 1GB Free Internet! 2GB 42Tk Anytime! Lowest call Rates at 48Tk Recharge! Internet, minutes or call rate, Banglalink now provides you with extra validity on your special packs! Buy as many times as you want during the campaign period. Only Banglalink gives you the longest validity and the greatest benefits at such a low price! The offer is applicable for prepaid customers who have activated their SIM on or after 14th November, 2018. VAT, SD and SC applicable. Voice or Internet, now you can enjoy them worry free for as much as you want! With the first recharge of Tk. 48 you can enjoy 54 paisa/min to any operators for three months! 1 second pulse applicable. With the first recharge of Tk. 48, you will also receive an instant 1GB of internet, FREE! * Buy as many times as you want for the first 90 days, NO daily capping, NOworries. A special tariff of 54 paisa/min to all operator numbers (1 second pulse), valid for 90 days. Already finished your bonus internet? No problem! 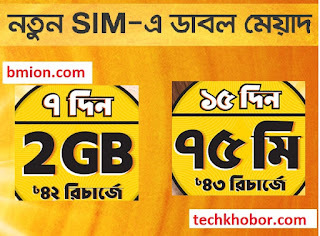 Your new Banglalink SIM has you covered, for only Tk. 33 you can enjoy 1GB for 7 days! Buy as many times as you want for the first 90 days, NO daily capping, NOworries.